A pair of conjoined twins are preparing to celebrate their second birthday after doctors gave them just 24 hours to live. Callie and Carter Torres, from Blackfoot, Idaho, were born in January 2017 attached at the pelvis and sharing the same legs. The girls are omphalo-ischiopagus twins, meaning they each have their own set of vital organs. 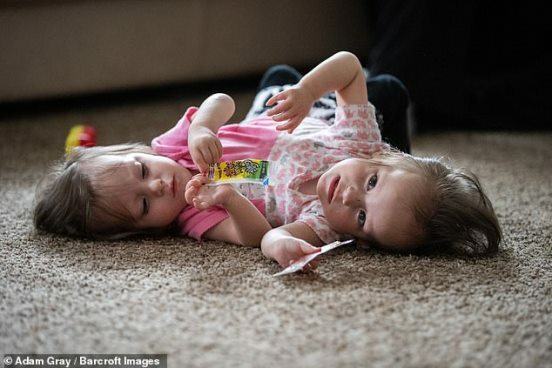 Although as few as 40 per cent of conjoined twins survive past birth, Callie and Carter are already learning to walk and have come off all medication. And while separation surgery is an option, the girls' parents Chelsea, 25, and Nick Torres, 24, insist the sisters are stronger together. 'The girls' health right now is really good. They don't have to take any medication, they just get little colds here and there like normal kids,' Mrs Torres said. 'It's incredible to think they have separate hearts, separate stomachs, separate heads – separate personalities too! 'In the very beginning we did think abortion would be the best option. We thought they would die as soon as they entered world. 'But we're just so pleased we stuck with our gut. Before their arrival, Callie and Carter's parents were told they were conjoined and might not make it. However, when the girls were born, all of their worries faded away. 'It was a huge pressure removed from us, because that dreaded thought of "my babies are going to die when they come out" just went away. 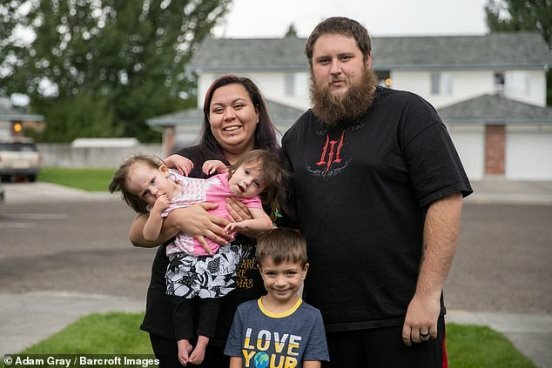 After overcoming the shock of their daughters being conjoined, the pair decided against separating the girls as newborns and are still shunning the surgery. 'We don't feel comfortable separating the twins at this point,' Mrs Torres said. 'They are going to be more unhealthy when separated, than they are right now. 'The only way we would consider it is if Callie and Carter have sudden health issues that arise or if they want to be separated when they are older. 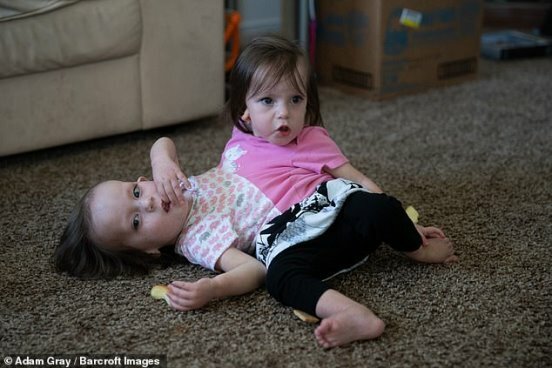 The devoted parents are trying to help the girls learn how to walk together, which is a struggle for all conjoined twins. 'Doctors don't expect them to walk until they are around four. Honestly, I think it will be more like eight,' Mrs Torres said. 'We don't expect coordination to start happening until they are a lot older. But we thought we might as well start to try early. As well as walking being difficult, tasks most parents don't give much thought to are also challenging for Mr and Mrs Torres, such as finding clothes. 'We were vastly unprepared for the girls to come,' Mr Torres said. Mrs Torres added: 'I actually decided to start making the girl's clothes myself. 'I buy regular clothing. I take two of each item - they have to be the same size and the same brand. 'I then cut them from the back and sew them together through the middle. Thankfully for the parents, their five-year-old son Jaysin is always keen to lend a hand. 'The three of them all get along pretty well,' Mrs Torres said. 'If the girls are crying and one of us is busy, Jaysin will go in there and play with them until we are done. But members of the public can be less understanding towards the family. 'When we are out in public with the twins, we get all sorts of reactions,' Mrs Torres said. 'There have been old ladies who have been like "oh, God wouldn't have wanted those children alive". Mr Torres added: 'But you know what, that doesn't matter to us. 'Just knowing that our girls are healthy and are learning at an everyday rate, it's a great feeling. Although they spend every second today, Mr and Mrs Torres add Callie and Carter are developing very different personalities. 'Carter, for the lack of a better term, is a little bully. If she wants something, she will take it,' Mrs Torres said. 'And if she doesn't want Callie to have something, she'll make sure she doesn't get it.